SINGAPORE: HSL Constructor will build the Republic's third desalination plant in Tuas, the PUB announced on Monday (Nov 16). In a press release issued on Monday, PUB said that it selected HSL Constructor from an open tender that attracted eight bids. "At a tender price of S$217 million, HSL Constructor offered the most competitive price for the design and construction of the plant," said PUB. The plant is expected to start operating in 2017 and will add another 30 million gallons, or 136,000 cubic metres, of water per day (mgd) to Singapore's water supply. Singapore currently has two desalination plants, the 30mgd SingSpring desalination plant, and the 70mgd Tuaspring Desalination Plant. PUB has also awarded a consultancy services tender for a fourth desalination plant, which will be built at Marina East. Desalinated water is one of PUB’s Four National Taps, a long term water supply strategy to ensure a robust and sustainable supply of water for Singapore. The other three sources are water from local catchments, imported water from Johor and NEWater. 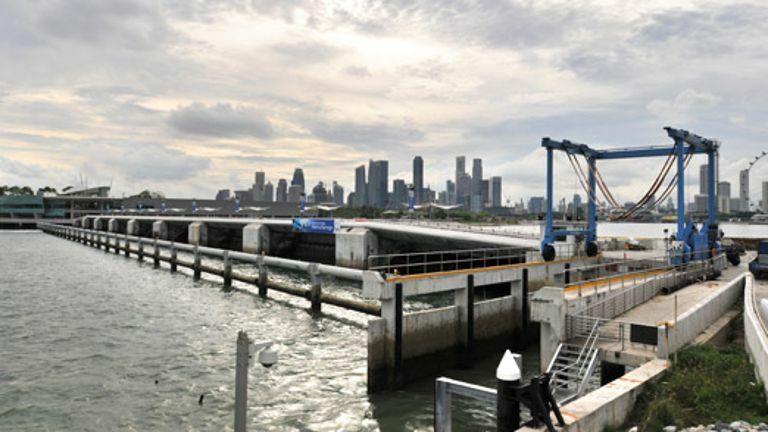 Desalinated water currently meets 25 per cent of Singapore’s water demand. With water demand expected to increase, PUB intends to increase desalinated water capacity in order to continue to meet 25 per cent of future water demand in 2060.